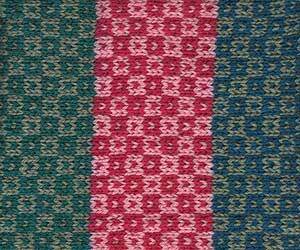 I used approximately 45gm of scraps of 8 ply wool in different shades of turquoise, pink and green. Cast on 47 sts and work using the fairisle method, swapping light and dark colours every 4th row, following the chart until 63 rows have been worked. Change colours as desired (I changed after every 7 pattern repeats, then turned my square sideways).